 "Israeli Company Invests in Kazakh Uranium Plant," Nuclear Engineering International, 31 March 2000; Lexis-Nexis Academic Universe, www.web.lexis-nexis.com. Vitaliy Ponomarev, "The Nuclear Industry in Kazakhstan and Kyrgyzstan," Central Asia Monitor, No. 2, 1993, pp. 30-32. Oleg Bukharin and William Potter, "Kazakhstan—A Nuclear Profile," Jane's Intelligence Review, April 1994, p. 186. "In Steppe with Kazakhstan," Nukem, 1995, p. 8. Paul Carroll, "The Reconstruction of the Uranium Industry in Kazakhstan," Presentation at the Uranium Institute's Twenty Second Annual International Symposium 1997, Uranium Institute, www.uilondon.org. 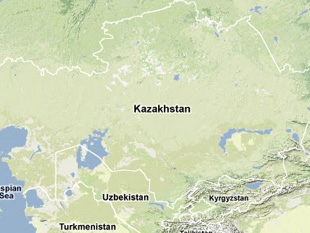 "Kazakhstan, Kyrgyzstan Sign Mining/Processing Pact," FreshFUEL, no. 426, 15 September 1997, pp. 1-2. "Kazakhstan Sells One of Largest Uranium Plants in CIS," Interfax, 16 April 1999. Dmitriy Gurevich and Yuriy Tsalyuk, "Uranium of Kazakhstan," The Globe (Vremya PO), 28 April 2000, No. 34 (452). "Fuel Cycle Facilities: Uranium Ore Processing," Nuclear Engineering International: World Nuclear Industry Handbook 1995. "Kazakhstan," Nuexco Review, 1994, p. 51. Aleksandr Kotseruba, "Uranium—the Republic's Property?" Karavan, 30 July 1996, p. 2; "Kazakhstan: Radioactive Waste Disposal Problem Viewed," FBIS-SOV-96-164-S. This article provides an overview of Kazakhstan’s historical and current policies relating to nuclear, chemical, biological and missile proliferation.